The rate of increase on inversion table production can’t really be quantified, and it’s no surprise many companies are actually into inverse table production. So, it’s not a problem if you are finding it pretty hard to select the best inversion table that suits you the most since every company has resulted in building new and different models of inversion tables. Therefore, you as an individual is left with so many choices of brands and models of inversion tables to choose from which could also be quite troublesome and very confusing. Well, I believe you must have gone through different kinds of articles on inversion tables with no satisfactory results or hope to help you pick the one that’s best for you or anyone you are trying to get it for. 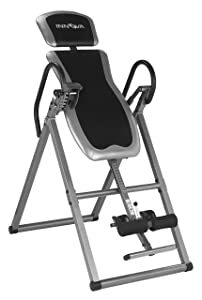 In that case, you should trouble yourself no more because we will be taking you through course of what inversion table and make you understand which brands and models are the best top 6 inversion tables, their benefits and drawbacks and all concerning inversion tables to guide you and help you pick the best inversion table that suit you most. 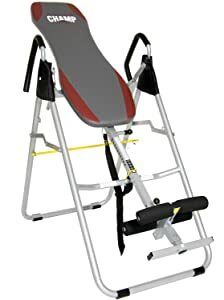 1 What Is an Inversion Table? Firstly, an inversion table can’t be truly understood without knowing what an inversion therapy is. The Inversion therapy is actually a form of spinal decompression and also a form of spinal contraction. The therapy requires being upside down or being inverted at an angle while being held hanging by the feet with the intention of achieving benefits that are therapeutic and this therapeutic process is called an inversion. So an Inversion Table can be simply described as equipment used to carry out an inversion therapy. For proper understanding and knowledge of inversion tables, it is necessary to know how it works. The inversion tables either come with manual operation options or motorized options. It can be used in a therapist or doctor’s office as a change in perspective of one’s view towards chronic pain in a different light. This can be used to reduce the pressure each vertebra exerts on the other. It is well known that our body weight is held up by the spine no matter the projection or position we are in and over time, chronic back pain around the lumbar region occurs as a result of compression and pressure. The same general functions still exist even though there are different models and some features may not be listed below on how it works, but be rest assured it follows the same functionality. The ankles are strapped to the holder while the user stands in an upright position on the table. Inversion begins as the table inverts while the user leans back leans. The degree of inversion can be chosen by the user (if applicable). When the user is eventually upside down, a 90-degree angle will be achieved. The idea is not to achieve a full 90-degree angle instantaneously but to avoid dizziness, lightheadedness and maybe nausea. In this sub-heading, we will be taking a close look at both the benefits of inversion table and its drawbacks also. Then we will know if the benefits of inversion table outweigh the drawbacks. The inverted table is used in reversing the harmful effects of gravity, and in carrying this out, is one of the best therapeutic treatments for load bearing joint issues, back issues, improving the nervous system, reducing mental stress, improving the mind, and so much more. Since the use of inversion table helps the blood flow through the body in one direction and in line with the gravitational force, the heart won’t have a huge task to carry out as the heart will be able to receive blood from every farthest point of the body through the help of gravity. When inverting the lymphatic system is stimulated to increase the flow of fluids that removes waste and cleaner blood gets to circulate better. The best results are gotten when using the inversion table for therapy on general back pains because it helps relieve back pains by providing full-spine traction. First and foremost the back must be prepared properly. You must first warm up the muscles and stretch them for a while before going through the inversion therapy for about ten minutes. With this, the pinched nerves which are as a result of the spine compression by the gravity get reversed and reduce pressure on the discs. The diaphragm becomes stronger when you use the inversion table regularly. It encourages deeper breathing when the lower part of the lungs gets filled with air more often. The lower parts of the lungs are more pristine and clearly more efficient at collecting oxygen than the upper portion of the lungs. Thus, the brain and other vital organs of the body get more oxygen as there is an improvement in your breathing. When all this happens, you will then find it far easier to breathe. Bad posture makes the upper back vertebrae and the neck to become undesirably compressed and out of alignment. Although a good physical therapist can help with good routines of exercise added to your activities so as to improve your posture. The truth is progress might be immensely slow and the possibility of achieving a good posture remains bleak. The use of inversion tables is simply the quickest way to solve the problem of severe compression of the vertebrae, extra tight muscles and the difficulty in loosening up by the muscle memory. Ligaments are not that elastic but are quite flexible and do tear whenever too much stretch occurs. Usually, we generally don’t give much thought to our ligaments and they are what hold the bone together. 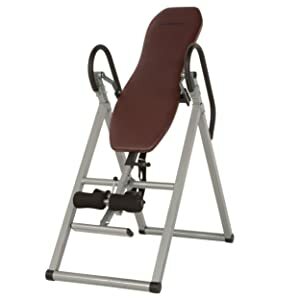 The inversion table is used to strengthen the ligaments and connective tissues by the reverse loading that occurs while inverting. People who have retinal detachments or glaucoma do experience increased pressure on their eyes, which can actually aggravate the condition and even cause the eyes to bleed. The inversion therapy is well known for creating elevated pressure in the eyes and anyone with such case is advised not try inversion therapy or use its table. This position also causes pressure to increase the inner ear, which may bring about discomfort and ear-related health problems. The probability of you pulling muscles while using an inversion table is pretty high. A respected massage therapist once said it is very easy to pull a muscle by overdoing it because there’s a belief that if hanging for two minutes is good, then 10 minutes might even be better. While inverted the heart tends to slow down and in a matter of few minutes, the blood pressure increases. This causes the heart to move blood through the body at a greater force than what it is used to. Therefore, those suffering from hypertension should stay away from inversion tables because it is dangerous to their health. As a result of large numbers of manufacturers, keeping up with the amount of brands and models of inversion tables as to which inversion table is best to choose can be very hard. So we have considered helping you point out what to look for while choosing the best inversion table. It’s advisable you get your inversion from a long established company that majors only in the production of inversion tables and avoid brands that focus on other products rather than inversion tables. If you have heard about (UL) Underwriters Laboratories, then you will agree with me that checking for the UL Mark is a necessity because it signifies that the table has been tested and safe for public use. Quality you know they say beats quantity. Since you will be using a product that will help you invert, taking note of the quality of materials and avoiding brands with poor quality are highly required. Here product research, consumer feedback and expert opinions combination are used to create shortlists of the best products of inversion table on the market. The products below have been screened to meet various requirements for your performance and safety. This inversion table has a durable steel frame with a scratch preventing powder coat finish to help it look very nice. Its cushion thickness is about 1-1/2-inches of dense memory foam covered with PVC and some features like extra-long handles for safety, ankle cushions molded ergonomically, easily adjustable tether straps that control the angle of inversion, it inverts up to 90 degrees, 3 adjustments to help start your inversion angles and a portable lumbar pillow. The Ironman Gravity 4000 gives a great back support provided by its lumber pillow. It’s very easy to assemble and store. 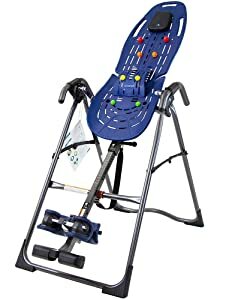 Nonetheless, this inversion table is a very safe table that’s stable, durable and provides comfort. The only drawback of this inversion table is that the inverting angles can’t be set easily. The Teeter Hand Ups EP-560 is a great table with, heavy gauge steel components, pressure reducing elements, patented track style bed with heat and specialty foam to supports your ankles. There are 4 sizes of acupressure nodes that can be placed anywhere you want so as to aid the healing pressure needed to support your spine muscles. Some of its other features include self-locking ratchet buckles, ComforTrak bed with an advanced track schemes that hold the Teeter’s accessories that give lower back support and pressure-point massage, Grip-and-Stretch Handholds, a removable head pillow, an adjustable tether that has a pre-set rotation control, no extended reach ankle system. Your exercise routine can also be tailored with Teeter EZ-Up Gravity Boots, EZ-Stretch Traction Handles and also the Vibration Cushion all sold separately. The table can support a 4ft. 8 inches to 6ft. 6 inches person weighing about 300 pounds. This inversion table can be easily assembled, stored and maintained. The frame is made from a good material which makes it very durable. Moreover, this table gives maximum comfort and security to your ankles by the specially designed ankle locking system. Its only drawback is its maximum angle of inversion is 60 degrees, unlike other average models that have an inversion of 90 degrees. The Exerpeutic Inversion Table is designed with a strong 1.5-inch steel square frame with a powder coated finish to prevent scratching. It has ankle holders which are combined foam roller with cushions to hold ankles securely. It also features adjustable tether straps to control for different inverting angles, an ankle release easy-pull pin system, and handlebars covered with full-loop foam. The inversion table will hold a person weighing 300-pound and its height can be adjusted from 4ft. 10 inches up to 6ft. 6 inches and can invert to 180 degrees. The tables’ backrest gives maximum comfort than those without padded backrest and comes with an ankle cushion that gives both comfort and security. 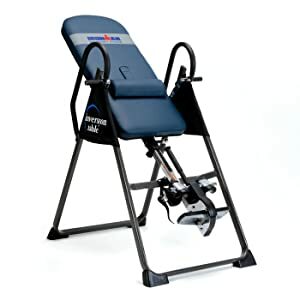 Exerpeutic Inversion Table is quite heavy as it weighs over 64 pounds which make mobility tedious. The backrest needs to be removed before it can be folded that is, it can’t be easily stored. The Body Champ IT8070 is specially designed in a way that it has a dual-pin system that assists users set the right position needed and it can support a person with height ranging from 4ft. 7 inches to 6ft. 8 inches and body weight of about 250 pound. Some of its key features include four foam rollers that cover your ankle for safety and comfort, U-shaped handrails that give control when inverting, a safety strap helps control inverting angles and a safety lock. The Body Champ IT8070 is very easy to assemble and quite pocket friendly. It can be easily folded and stored. The strap may break after being used for a long time, so it is advisable you replace it when it happens. The Body Champ IT8070 is user-friendly and gets the job done at a very good price. Apart from the fact it’s quite cheap, it is the best for spine pressure reduction. The Body Champ IT8070 is not advisable for those with hip problems and it has limited features. The Ironman IFT 4000 Infrared stands out as one of the well-engineered and advanced inversion table available. The synergy between the traditional design and the FIR heat technology used to produce circulated heat that relaxes the muscles, ease tension and reduce pains made this particular inversion table a thing of beauty. It features a backrest with 5-inch infrared heat therapy, support users that weigh about 350 pounds with height ranging from 4ft. 9 inches to 6ft. 6 inches, a LEDs remote control that sets the temperature. The Ironman IFT 4000 Infrared inversion table is very easy to assemble even with household tools. Although it is quite heavy, consumes more space but the infrared heat is the one thing that justifies it and makes it stands out. This inversion table ankle system is believed to be the best. It’s a table with a full angle of inversion of 180 degrees and its only minus is that it is very expensive. The Innova Fitness ITX9600 inversion table is constructed from a heavy tubing gauge steel that makes it support a user weighing about 300 pounds and a height ranging from 4ft. 10 inches to 6ft. 6 inches. It features include, a soft touch foam handlebars and thick foam rollers and a nice padded backrest. The Innova Fitness ITX9600 can achieve four different angles of inversion which is made possible by the adjustable safety pin. It has very comfortable handlebars but the height adjustment bar can be difficult when adjusting and it has no pin to keep it folded for easy storage. The table has a true balance system and can be easily adjusted. Innova Fitness ITX9600 is not a full featured inversion table. Study all instructions carefully before using it. When adjusting the table, make sure you set it to your height and your head must rest on the table’s bed. As a beginner, it is advisable you start inverting at a safe degree like 90 degrees. Then you can gradually increase the degree as you get accustomed to being upside down. While placing your feet in the footrests, make sure you are standing and not resting against the table. Lean and hold on to the handlebars to start inverting and make sure it is done slowly. It is necessary you breathe deeply by inhaling through the nose and exhale through the mouth. As a first timer, you might find it discomforting being upside down for the first time. So, it is okay if you can remain inverted for about 2-3 minutes and you can start increasing it to about 10 minutes as you adjust to it. Work on your abs while inverted just by performing 12-15 of crunches. Repeat this routine for 2-3 sets. Pull yourself up slowly to an upright position and rest for some seconds before stepping out of the inversion table. The spontaneous increase in the level of popularity of inversion tables is as a result of its healing capacity, the way it combats stress, ease tension and back pain and the body in general. 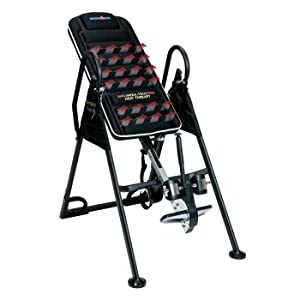 Now that you are well equipped with all this information, purchasing the best inversion table will be very easy. Hey. Nice helpful article on Inversion Table.